Summary: One house, two worlds…book two in our sumptuous and enticing YA series about the servants and gentry at Somerton Court. 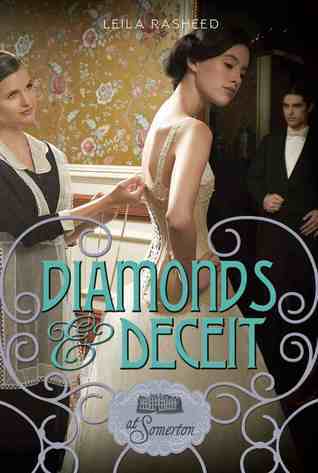 But then, as you read further, you find out that Diamonds and Deceit is not a story that exists in a vacuum. Diamonds and Deceit is told from the point-of-view of both the upper class ladies and the lower class servants. POC make an appearance in the form of Ada’s true love Ravi, and the nursemaid Priya. And Sebastian is in cheesy true love with his valet — well, a lot of people are, to be fair. Even a feminist fighting for suffrage plays a role. And it’s not quite the same time period as a regency romance — people have cars and Queen Alexandra’s on the throne. I enjoyed this one, but none of my students have heard of Downtown Abbey… unless it’s something their mothers watch. I don’t know a lot about this period of English history, but found the presence of Indian characters interesting. There was even a nurse in the BBC program Casualty 1909 who was of Indian descent. I’d like to read more about this period of history in England now!